First, download the icons you’ll need later from this page. 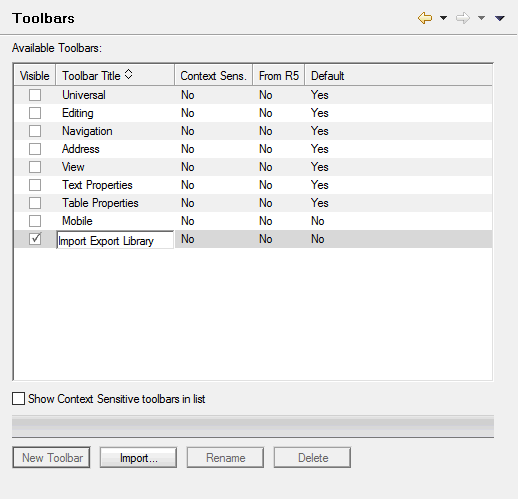 Enter something you want to call your new toolbar, such as "Import Export Library". Press enter when finished. 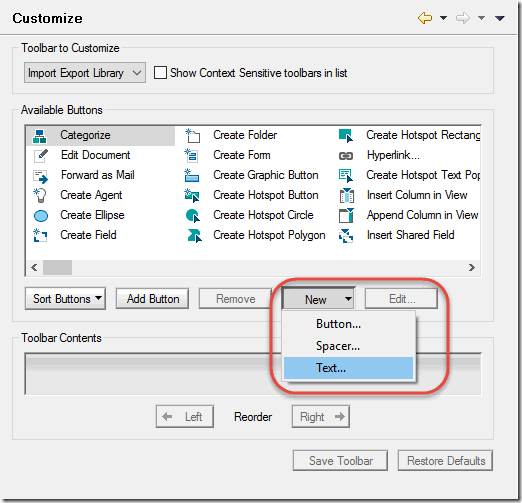 ... and then ensure that your newly created toolbar is selected in the Toolbar to Customize (marked by 2 above). 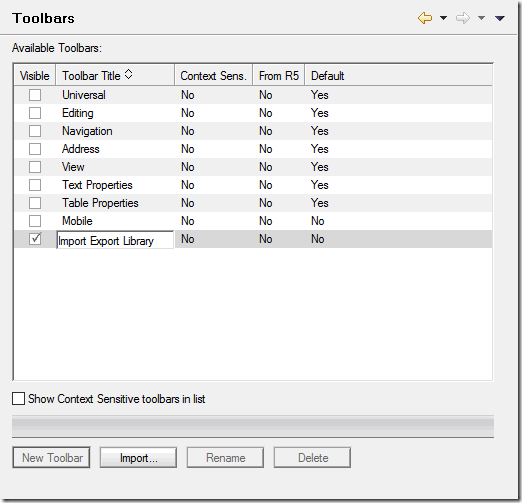 Enter something that you want to see in your toolbar, such as "Export view to Excel". Then it is time to add the first button. 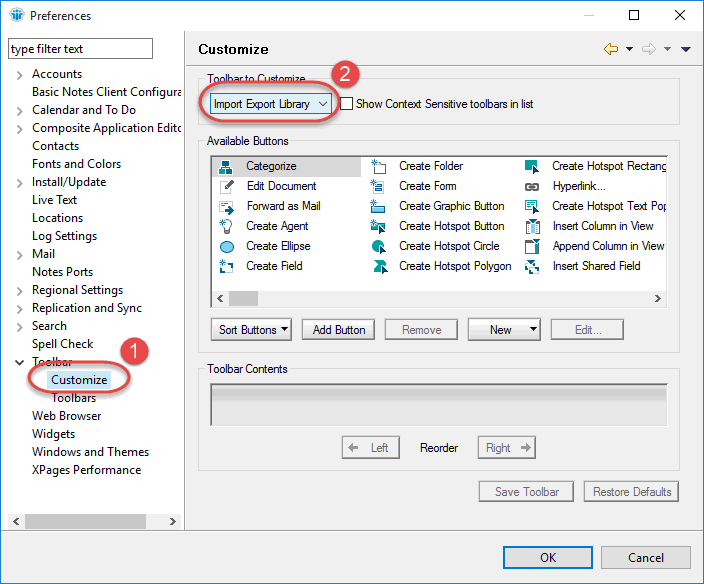 This button will be the button that just launch Notes Import Export Library in export-mode, with the dialog box, so you can control everything yourself. 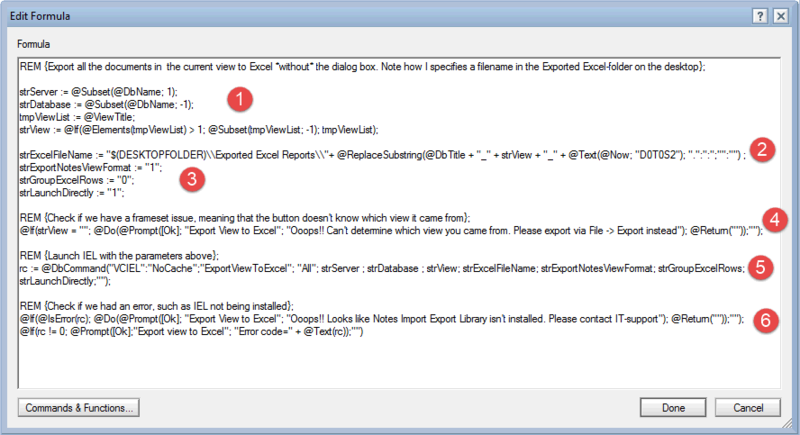 This is the same as choosing one of the Excel export-menus in the File -> Import dialog box. Note that we have some fields we can fill in. The first Button caption text is the text as we will see it it in the preferences dialog box etc. 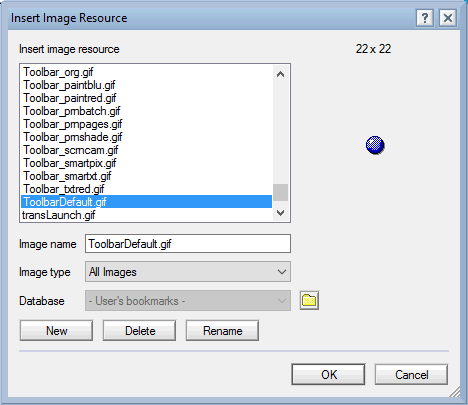 Since this is a buttonand not a text , we will first and foremost see only the icon in the toolbar. The Popup help text is the text that will be shown when you hover the mouse over the toolbar button later. 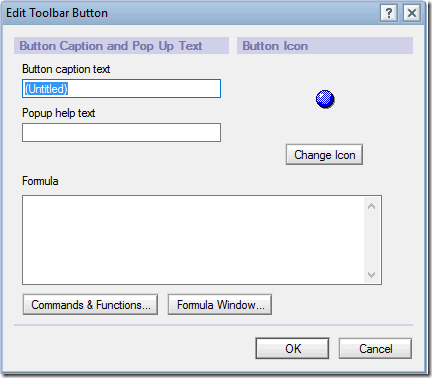 The Formulais the actual @formula to run when the button is pressed. Finally you can change the icon. 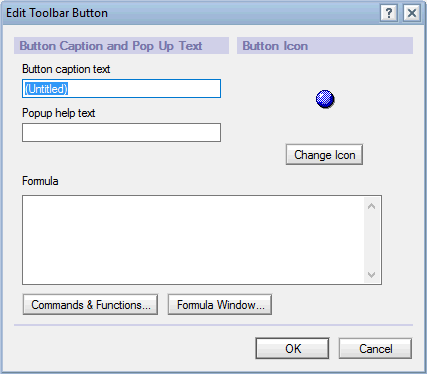 Lets start with the text fields Button caption text , Popup help text and Formula (by the way, to make it much simpler for you to both read these instructions -and- to edit the dialog box at the same time, I suggest that you copy the following sections to a text editor som you can easily copy and paste between the editor and Notes). Another tips with the formula-text is that you can edit in the a separate (and resizeable) window by clicking on the Formula Window-button. Unless you find something you like in the list of image resources above (not much likely!! ), click on the New-button. 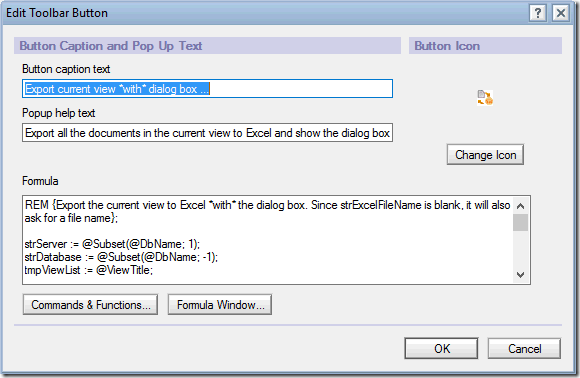 This will open a standard File-selector dialog box. 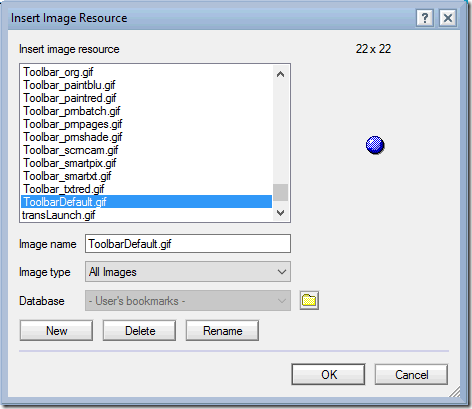 Select the first "Notes Import Export Library - Export.gif" file. Click OK when done. 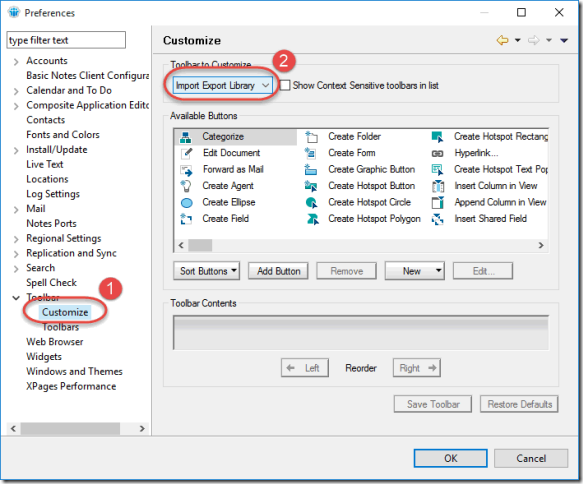 Export all the documents in the current view to Excel instantly! 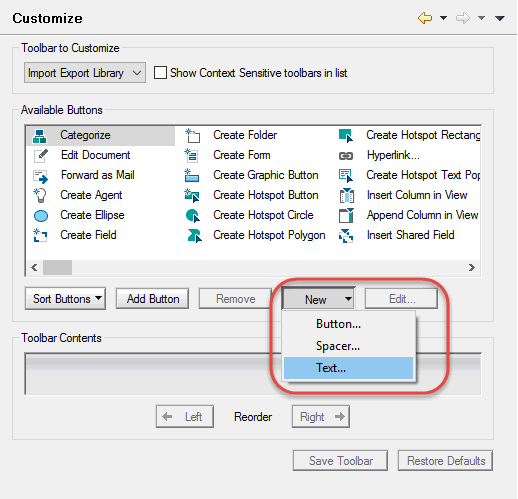 Export the selected documents in the current view to Excel instantly! At (1) I determine which server, database and view you are currently working in. 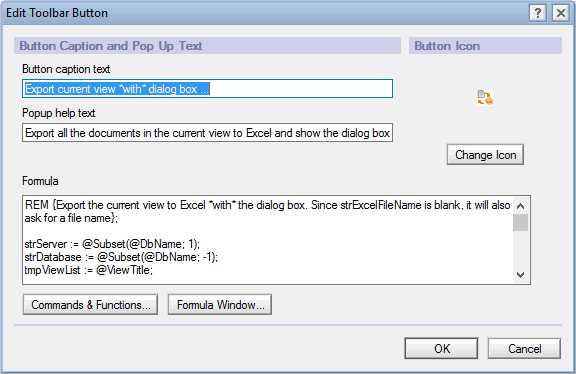 At (2) I set the output folder and file name of the Excel file generated by IEL. Note that IEL knows a whole lot about system variables, and the variable @(DESKTOPFOLDER) is a variable pointing to your Desktop. 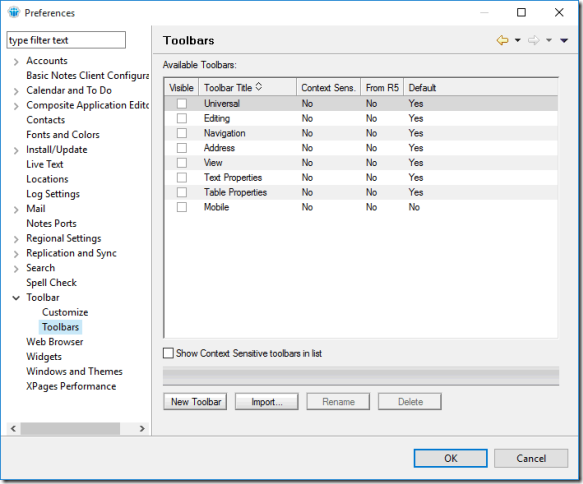 the variable strExcelFileName will contain the full path to your folder Exported Excel Reports located on your desktop. strGroupExcelRows = "0"; IEL won't group any categories for you. strLaunchDirectly = "1"; IEL will export the view and launch the Excel spread sheet instantly. At (4) I check if I find the environment to be a view. If only a frameset, or document, or something that IEL can't figure out to be a real Notes view, it stops now. 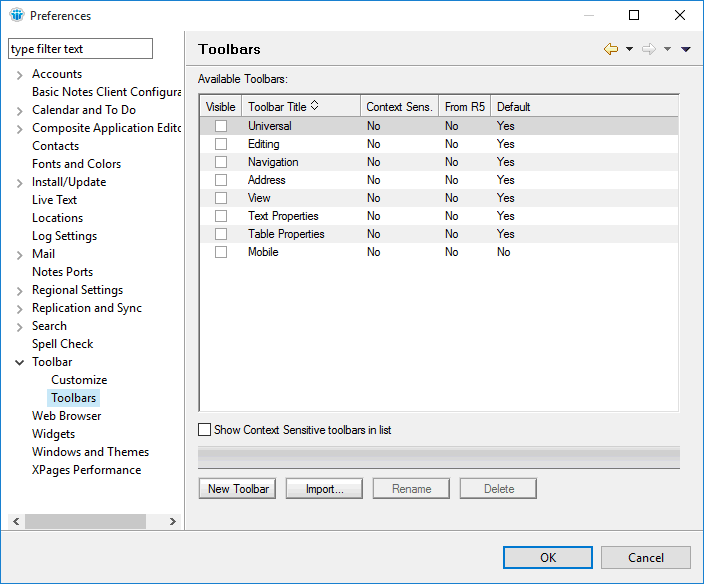 At (5) we can IEL as a Notes Database Driver command with all the parameters specified above. Note the "All"-parameter. It instructs IEL to export all the documents in the view this time. 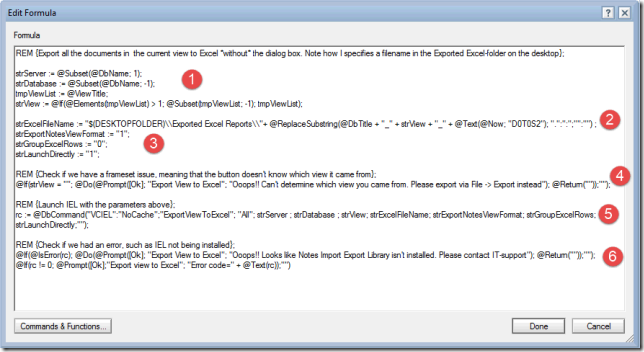 Use "Selected" to export only the selected documents. At (6) I attempt to pick up any error and display it to the user.